Jason Pugliese was looking for answers. He was a few years out of college and running a startup concession business in Colorado. But something was lacking in his life, and he knew it. So he traveled the country, simultaneously running his nascent business from the road and committing himself to studying many of the world's great spiritual traditions. He leaned heavily into yoga and meditation and lived in a cabin on the boundaries of Rocky Mountain National Park for a time. Somewhere along the way, he changed his first name to Dharma. But Pugliese's great epiphany arrived while camping on a beach on the island of Kauai in Hawaii, not long after he turned 30. "I haven't really talked about this much," he says, rubbing his short brown beard. 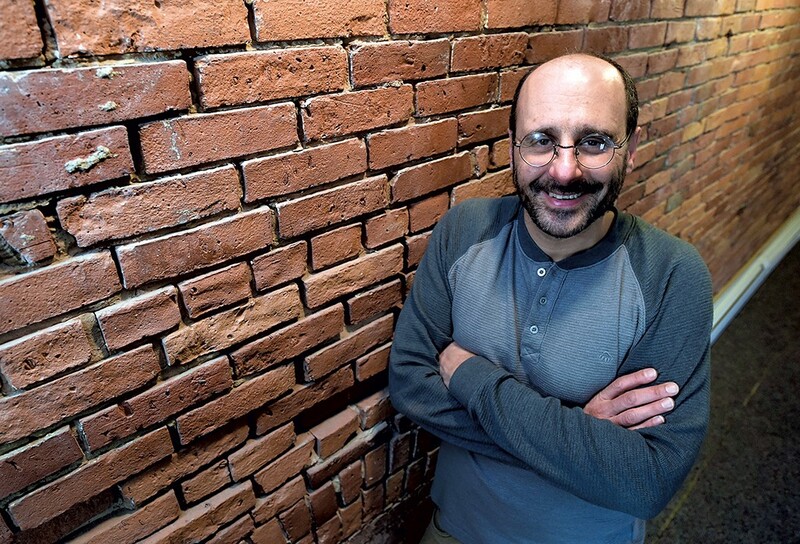 Pugliese, now 47, is the founder of the Holistic School of Business in Montpelier, an organization that provides local small business owners with a variety of educational and support services, from startup strategy to marketing, all of which are filtered through a crystal prism of holistic and wellness principles. Pugliese traces the origins of the school to that winter night in Hawaii nearly 17 years ago. Pugliese says he was dissatisfied with the politics of the time — specifically, the impending 2003 U.S. invasion of Iraq. He and his then-partner were also expecting a child, which further impacted his dimming worldview. But then a light came on. "Suddenly, all of my answers were just clear," he recalls. "I felt at one with our planet and all the people on it. "I realized I couldn't live in this country anymore unless I fully committed myself to making a difference," he continues. So Pugliese turned to an atypical background for an activist: his business training. A graduate of the business program at Bryant University in Rhode Island, he had become convinced that the modern business world was inherently broken. To combat a culture that he describes as obsessed with "shame and overly critical thinking," he hatched an idea that would take a decade to manifest. He moved to Montpelier in 2003 and ran a bookkeeping and tax company in the intervening years while that idea gestated. In 2012, he finally opened the Holistic School of Business in downtown Montpelier. Pugliese exudes an energetic, if measured, demeanor. He chooses his words carefully, but there is an authentic positivity in everything he says. When he explains that he founded the school to help others find their calling to help others — a sort of infinity loop of service to the betterment of humanity — there isn't a trace of irony in his voice. His casual assuredness in his philosophies is infectious. Pugliese is a believer who wants others to believe in themselves and their ideas, no matter how unorthodox they may be. "Our mission is to help heart-centered entrepreneurs start, market and build thriving and profitable businesses that are also in alignment with their life purpose and values," says Pugliese. The term "heart-centered entrepreneurs" might seem like an oxymoron to cynics, but to Pugliese the concept is at the very core of his school. "We work with people who want to make a difference," he asserts. Whether psychologists, yoga instructors, Reiki practitioners or others in Vermont's niche small businesses, all of the school's clients are taught to find their purpose through authenticity. A client who knows their purpose, the program teaches, can fulfill it more effectively. "In any ancient wisdom tradition," says Pugliese, "there's this common thread where we transform ourselves and we have this outer path of service, which is a reflection of our own self-transformational process." In a highly competitive capitalist society, authenticity isn't always a simple matter. To help their clients maintain focus, Pugliese and his instructors teach specific meditation and holistic practices — "mindfulness practices," as he calls them — that he believes "really help people stay connected to their heart." That particular lesson stuck with Dr. Jason Frishman, who studied with Pugliese at the Holistic School of Business. A licensed psychotherapist who works in Burlington, Frishman recently began a new venture called Nourished Connections. The business focuses on the psychological well-being of families through shared meal traditions. "I felt like my bags were packed, but I didn't know where to go," says Frishman, who is also a chef. He had long thought Nourished Connections could be a helpful program, but he didn't know where to start. One phone call with Pugliese, which found Frishman lying on his own clients' couch as the possibilities unfurled, convinced him that the Holistic School of Business was the answer. "The work with my clients has skyrocketed," says Frishman. "We are reaching places with our clients that are deeper and more forward-moving than it's been in years. In many ways, [the school] allowed me to live the program that I was developing." Preaching the gospel of positivity is only a small part of how the school instructs its students. Ninety percent of the program, Pugliese says, comprises practical advice on marrying mindful philosophy with sound business strategy. Specifically, that means identifying and reaching your clientele. "It's how to create a sales and marketing system that will attract the customers our clients are meant to be servicing," says Pugliese. Like many of his students, Pugliese services a niche within a niche market. To do so successfully often requires adaptation, which is a lesson he both teaches and follows. For example, the Holistic School of Business is now an entirely online entity. Pugliese runs it from his home office, having recently vacated the school's original downtown Montpelier digs. The move was made in part to better serve a student body that increasingly comes from all over Vermont. "It helps our clients out," says Pugliese of the online move. "Instead of spending all that time driving across the state to come to classes, they can just log on in their pajamas if they want to." Working online also allows Pugliese to work directly with each of his clients individually. And he's eager to share insight both from his business background and an expansive ancillary education that includes studying under a Zen master and a Tibetan monk. The resulting sessions can feel like equal parts business seminar and meditation retreat. But it's a method and strategy Pugliese has carefully crafted over the years. One recent client is Sueanne Campbell, a therapist who practices PureBioEnergy — a method of healing that deals with the transference of energy between healer and patient. She sought out Pugliese to grow her nascent practice after retiring from other work last June. "I worked for a nonprofit forever. I was a teacher forever," she explains, "and I had these businesses that were part-time businesses, really. After doing Dharma's program, though, I felt like just because I wasn't really a 'business person,' that doesn't mean I'm not a businessperson." Campbell, who runs her practice in Shelburne, experienced a near-immediate change as a result of using what she learned at the Holistic School of Business. In addition to increased confidence, Campbell discovered how to charge properly for her services, among other things. She says Pugliese also helped her to demystify the business side of her business and her long-standing ideas of what a businessperson can be. "I had these preconceived notions of what a businessperson is like," she says. Campbell's experience is not uncommon at the school, says Pugliese. "It's about changing old belief systems," he insists. To get past deeply imbedded culture barriers, he teaches his clients about the Law of Attraction, a tenet of New Thought philosophy which posits that negative or positive thoughts impel negative or positive experiences, respectively. "The first step is asking for what you want — visualizing it and surrendering to it," Pugliese explains. The second, equally important step, he says, is "believing you'll receive what you want." The third and final step is achieving the original goal and understanding that success is a deserved result of the work and belief that went into acquiring it. Once success is achieved, however, might not the school's idealistic belief system bump up uncomfortably against the looming behemoth of American capitalism? "There's a camp of people who want nothing to do with capitalism," Pugliese acknowledges. "Our camp is slightly different: We view money as energy; it's a form of consciousness." That's an eyebrow-raising statement. And Pugliese strengthens his resolve when pressed on the seeming contradiction between capitalism and consciousness. "In an ideal world, we wouldn't have a capitalistic culture, but we do," he says. "So in the spirit of acceptance, we make a conscious decision to harness money to make a greater difference. The more money our clients make, the more difference we're going to make in the lives of other people on this planet. "What we're doing at the school is working toward a revolution," he continues, "a business revolution that will help create an enlightened society." Pugliese knows how to act on big dreams, which he says often sprout from little ideas. "We're just planting seeds," he says with a broad grin. "And those seeds, those ideas, will grow." The original print version of this article was headlined "The Heart of the Deal | Dharma Pugliese aims to grow a holistic business revolution"